It was hard to know what to expect. I’d heard Erik Griswold perform some pretty way out stuff. 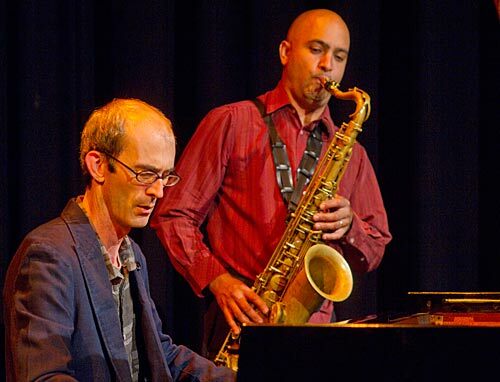 And Adam Simmons has been known to deliver some fiery blasts from from the saxophone, in particular during a ‘sax armageddon’ with Peter Brotzman and Kris Wanders at the Melbourne Town Hall in 2010 for the Melbourne International Jazz Festival’s Overground. But after being treated to the musical intricacies, subtleties and delights of Prestidigitation at this excellent venue beside the Maribyrnong River in Footscray, I regretted only that I had not applied some gentle pressure to encourage friends to take a little risk, come along and enjoy. What the tiny audience saw and heard was highly inventive, but by no stretch of the imagination hard to take. Instead of any bid to blast us out of the auditorium or mystify with odd sounds, Griswold and Simmons displayed great sensitivity in their explorations of the timbres and textures of their many instruments. Prestidigitation is defined as “magic tricks performed as entertainment”. After experiencing the performance, I felt that the German expression “fingerspitzengefühl” would also be an appropriate description. Griswold and Simmons seemed to have that “finger tip touch” — intuitive flair or instinct, a great situational awareness and the ability to respond most appropriately and tactfully. This outing had elements of Simmons’ instructive and entertaining previous solo performances on his array of breath-driven devices, and a little of his work with the Toy Band. But it was not just a case of two musicians throwing together some toys and seeing what eventuated. Yes, it was often fun, and often joyful and exuberant. But it was also moving and a delightful audio treat. One musician in the audience had the right idea, I thought, closing his eyes as he settled comfortably into one of the bean bags in the front row and letting the sounds wash over him. The slideshow below can be paused to show a particular image for longer. So what was it that made Prestidigitation work? The musicians may have the best insights into that (for their thoughts about improvisation the current tour see Jazz Planet’s Q&A), but I think it reflected their abilities to take instruments they know well — some of them usually seen as toys — and extend the ways in which these could be utilised in unexpected ways. The genius (if that seems too strong, then creative power) of Griswold and Simmons was that the combinations of instruments they chose and the ways in which they used those instruments worked so well, so often. That’s where I thought their sensitivity was evident. Of course there were times when the array of colourful spinning tops or little squeezeboxes seemed to be more for novelty value than great music, but they were a lot of fun. Adam Simmons told Jazz Planet that “if there is a strength and artistic commitment in a piece of art … it will communicate at a fundamental level with anyone”. I think that will hold true of this performance as it tours parts of Australia. The audiences may not know what to expect, but if they take a little risk and try the show, I’d bet Griswold and Simmons will communicate — in spades. This entry was posted in GIGS and tagged Adam Simmons, Erik Griswold, Footscray Comminity Arts Centre, Prestidigitation. Bookmark the permalink.